Achieve extraordinary results in business and in sales. The old adage, “Nothing happens without a sale.” is true for any business. It make sense that the sales person, the one on the front line with your customers, would be highly trained and skilled, and continue building his and her skills throughout their career. Incredibly, this is far from the reality. Most sales persons are given little, if any, sales training and nearly no sales coaching. Most companies assume that product training is the same as sales training and throw the new comfort advisor, new account manager or new territory manager into their assignment with little more than a product literature sheet to “sell” with. Professional sales training and coaching includes the study and education of how people make decisions and how to relate to all buying styles. It teaches the importance of establishing rapport and building trust, with intention to serve the customer and create a lifetime client relationship. It teaches how to evaluate territory and account potential and assess the probability for gaining new business. And it teaches how to get agreement when asking for new business. There is no better investment, and there is no faster return-on-investment than in sales training and coaching. 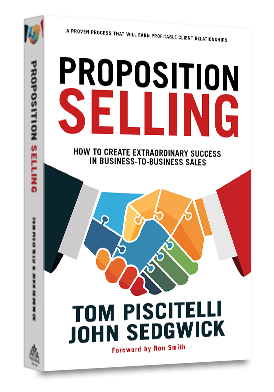 Our new book and companion website, Proposition Selling focuses exclusively on the unique challenges and methods of business-to-business sales. Co-written by Tom Piscitelli and John Sedgwick, who together we have a combined eighty-plus years of experience in business and sales. If they’ve learned one thing, it’s that you need to know your customer. Proposition Selling is all about how to sell with the customer in mind. It outlines a proven process that will earn profitable client relationships, which requires the salesperson to earn the right to be seen as a business partner in a business-to-business relationship. Join Tom and John as they take you through the Proposition Selling process. The Proposition Selling B2B sales process accounted for 30 percent of our year-over-year revenue growth.